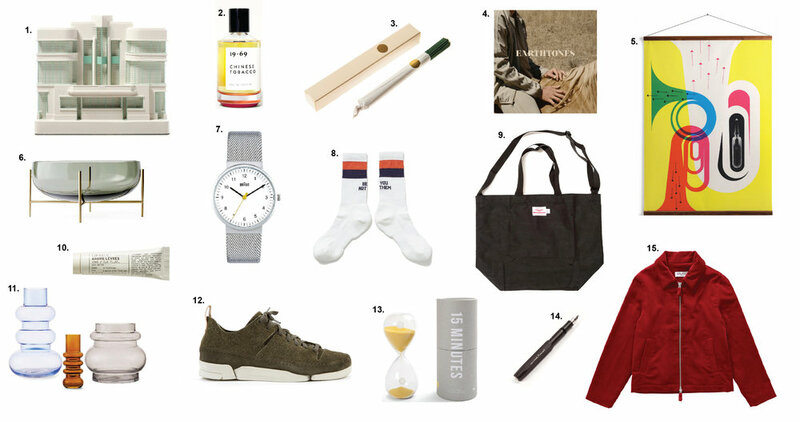 It’s that time of year again, gift guides are out in force so we thought we’d give it a go, here’s what we’re hoping for under the tree. Disclaimer: They’re really hard to do. 1. No One Is Normal Tote Bag £35 www.theschooloflife.com - Quality tote and message from The School of Life. 2. Beastie Boys Book £32 www.faber.co.uk - Story of the influential hip hop band across nearly 600 pages includes rare photos, illustrations, a cookbook, a graphic novel and playlists. 3. Helsinki Central Station Model £195 www.chiselandmouse.com Ace architectural sculpture of this iconic building for your desktop. 4. Canvas Breton Cap £25 www.theshopkeeperstore.com Authentic french made sailing hat. I was bought one last christmas and have worn it every day since! 5. NFL New Era Cold Weather Sport Knit £25 - www.europe.nflshop.com Essential fashion accessory at the recent NFL London games. Seahawks pictured but there are 32 teams to choose from. 6. Freedom To Exist Watch £99 www.freedomtoexist.com Designer minimalist watch from this cult independent watch brand. 7. Karhu Champion Air Trainers £80 www.karhu.com 70s reissue of these Cult Finnish trainers with air cushion soles. One for sneaker heads. 8. Mini Moderns Pencil Set £8.99 www.minimoderns.com Everyone loves a pencil set, these are tipped with 6 delicious Mini Moderns colours. 9. Universal Works Barra Jacket £219 www.universalworks.co.uk Olive Corduroy vintage style workwear jacket from Universal Works. 10. Iittala Ultima Thule glass set £37 www.iittala.com Design classic inspired by the melting ice in Lapland. 11. Tom Pigeon Block and Ball Print £40 www.tompigeon.com A3 screen print that plays with the tension and balance between simple geometric forms and bold colours. 12. 365 Day Stalogy Notebook £24 www.nittoonlineshop.eu Japanese designed minimalist multi purpose notebook. 13. New Order True Faith Mug £10 www.store.neworder.com Featuring Peter Saville artwork from this 80s classic. 14. Vintage Juventus Shirt £49.95 www.retrofootball.co.uk Classic football gear as worn by Platini in the golden age of Italian Football. 15. Primal Scream’s Give Out But Don’t Give Up: The Original Memphis Recordings £21.99 www.roughtrade.com In 1993 Primal Scream went to Memphis to make an album that album never saw the light of day, until now. Best LP the Stones never made. 1. Hoover Building £195 www.chiselandmouse.com - An intricate model of the iconic art deco building, perfect for any shelf. 2. 19-69 Eau de Parfum - Chinese Tobacco £140 www.goods-shop.co.uk - A spicy and woody scent from the cult cosmetic brand 19-69. 3. Golda Hiba Wood Incense £18 www.wolfandgypsyvintage.co.uk - Made with Hiba essential oil - found only in 300 year old Aomori Hiba trees, the scent is a uniquely citrusy and cedar-like. 4. Earthtones £8.99 www.bahamasmusic.net - From Toronto-based Bahamas, this is the perfect nod to ’70s R&B. 5. ‘Music Graphics’ Wall Chart from £160 www.surfaceview.co.uk - From The Land of Lost Content Collection at Surface View this retro print will brighten up any room. 6. Échasse Bowl £239.95 www.skandium.com - Designed by Theresa Arns for Menu the Échasse Bowl is a playful take on the elegance of a traditional glass bowl. 7. Braun BN0031 Watch £105 www.endclothing.com - A classic and timeless watch from one of the most influential watch manufacturers of the 20th century. 8. The ‘Be You Not Them’ Sock $38 www.kule.com - Next year’s version of the slogan tee. 9. Battenwear Packable Tote £50 www.peggsandson.com - Lightweight and versatile this tote is sure to become a wardrobe staple. 10. Le Labo Lip Balm £10 www.net-a-porter.com - A non sticky matt lip balm, an essential stocking filler. 11. Tivoli Balloon Vase from £42.25 www.skandium.com - Inspired by the Ferris Wheel inside Tivoli Gardens, these playful vases are timeless statement pieces. 12. Clarks Trigenic Flex £110 www.goodhoodstore.com - Probably one of the comfiest shoes you’ll ever wear. 13. 15 Minute Sand Timer £20 www.theschooloflife.com - Flip this upside down when you need 15 minutes to yourself. 14. Kaweco Sport Fountain Pen Aluminium £65 www.papersmiths.co.uk - a compact and timeless addition to any desk. 15. Groundhog Jacket £275 www.youmustcreate.com - Rich Berry Corduroy, a christmas jacket to rival Santa’s.